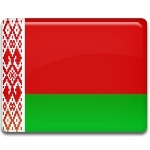 The second Sunday in May is State Flag and State Emblem Day in Belarus. This holiday was established by the Presidential Decree on March 26, 1998. The head of the state initiated the first Belarusian referendum on May 14, 1995. The referendum concerned many issues, including adoption of a new state flag and state emblem. 75% of Belarusians supported the idea, and the new state symbols were adopted on June 7. The current national flag is a red and green field with a white and red ornament pattern at the hoist end. The design of Belurusian flag is based on the flag that was used when the country was a part of the Soviet Union. Several changes were made to remove hammer and sickle and the colors of the ornaments were reversed. The state emblem of Belarus is also created on basis of the Soviet emblem. It's a green outline of Belarus over the golden sun rays. The sun is covered by the globe. Stalks of wheat (similar to the Soviet emblem) superimposed by flowers of clover (on the left) and flax (on the right) line the emblem.